Krone Vario Pack round balers from Kubota Tractor Australia are designed to offer superior performance in wet silage baling, hay baling or dry straw baling in challenging Australian conditions. The VP1500 and 1800 models of Krone Vario Pack round balers feature a slat and chain bale chamber system, which starts and turns the bales progressively. The crop enters the bale chamber via the 1.95m-wide galvanised pick-up with five tine rows. A tine spacing of only 55mm guarantees pick-up of even the shortest crop. The pick-up also features quick adjustable gauge wheels and an automatic chain tensioner. The standard crop roller ensures the crop is pushed onto the pick-up tine for better throughput. Once the material is pushed into the bale chamber by the feed rotor, the slats of the elevator ensure an instant bale start. 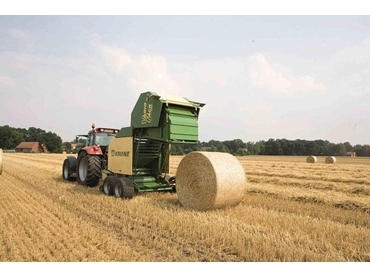 What really makes the Krone Vario Pack balers work in every condition is that the slats intermesh with the bale to keep the bale turning, preventing bale stops even in dry straw. This feature also reduces crumble loss of material, as the bale no longer slips during baling operation. The bale size can be altered by pushing a button on the monitor from 0.9m up to 1.5m on the VP1500 and 0.9m up to 1.8m on the VP1800. The bales can be tied with the reliable net or twine system. Replacing the net roll can be easily done from the ground in front of the machine. A rotor cutter with 17 knives is optional equipment for both VP1500 and VP1800 round balers. The knives can be pre-selected to 0 – 7 – 15 or 17 knives engaged to increase the cutting length longer than 64mm. In case a foreign object enters the cutter, the knives swing out of the chamber as they are spring-loaded. In case of a blockage, the rotor can be turned backwards with an optional hydraulic reverser. Grease banks and an automatic chain lubrication system ease daily servicing work. All Vario Pack hay balers can be equipped with an optional tandem axle for operation in wet ground conditions or a more comfortable ride in tractor balers. Labelled CP1500V, the same Vario Pack 1500 round baler incorporates a silage wrapper behind the machine. This allows the owner to bale and wrap their silage in one go reducing the need for a second tractor and operator, increasing productivity while keeping operation costs low. For hay or straw, the machine is able to accumulate two bales and put them onto the ground at the same time to reduce handling costs.